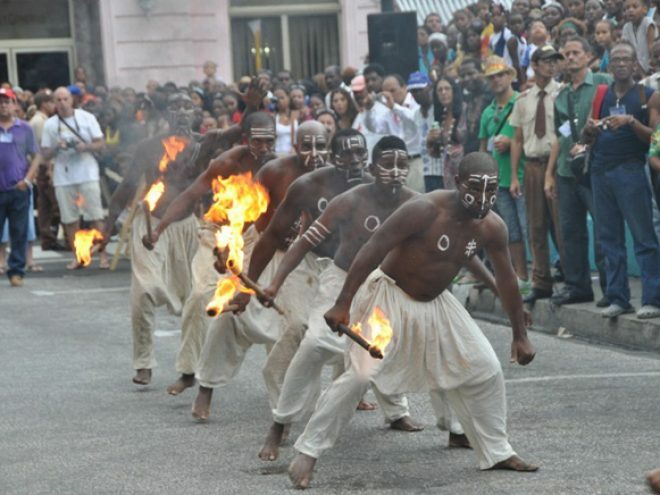 Initiated in April 1981, the Festival del Caribe received the support of many Latin American intellectuals, including renowned Cuban Fernández Retamar, Barbadian George Lamming, Dominican Juan Bosch, Brazilian Thiago de Mello, Colombian Gabriel García Márquez and Jamaican Rex Nettleford. One of the reasons why it became so popular so quickly is that it aimed at showcasing a segment of Caribbean folk culture that hadn’t yet received the level of recognition it deserved. The “El Caribe que nos une” (The Caribbean which Unites Us All) international colloquium focuses on issues related to the preservation, development and dissemination of Caribbean cultural diversity, as well as actions which could contribute to the unity of the region and promote a cultural exchange with the rest of America and the world. As is traditional, the 2014 Festival del Caribe will feature the Desfile de la Serpiente, or the Serpent Parade. Locals and visitors seem to enter into a kind of collective trance as they move at conga pace from Plaza de Marte to Parque Céspedes, displaying the spiritual richness of the men and women of the Caribbean, in a colorful display of contagious rhythm. For eight days, Santiago de Cuba will get no rest or sleep as its people, the true leading figures of this festival, immerse themselves in the cultural events that will occupy nearly 50 venues in the city, most of which will be open spaces. Santiagueros are experts at hosting this 34-year-old festival and at welcoming over 1,000 visitors that will be arriving from all over the Caribbean and other parts of the world. The week-long Fire Festival literally fires up the streets of Santiago de Cuba and its people. The Quema del Diablo (The Burning of the Demon) marks the end of the festival when all of its participants head to the seaside and there burn the Great Demon, which symbolizes all bad things. When it is burned, it is believed that the way is paved for the next year’s meeting. This year’s Fiesta del Fuego will be dedicated to Suriname, a South American and Caribbean country that is made up of elements that are present in all the region. Audiences will surely enjoy the music, dance, literature, cuisine, theater and visual arts proposals from Suriname in the eastern city of Santiago de Cuba, home to the largest festival dedicated to the Caribbean influence in Cuba. Six communities from Suriname have been proposed to receive the Casa del Caribe International Prize, which is awarded since 1999 to outstanding figures involved in the research and promotion of traditional popular culture. The 34th edition of the Fiesta del Fuego will also honor the Colombian writer Gabriel García Márquez and Dominican singer, Sonia Silvestre, both recently deceased. Sonia Silvestre, who was very popular in Cuba since her beginnings in show business, was the star of the 2006 Festival, which was dedicated to her country, the Dominican Republic. The Festival will also pay posthumous tribute to the Jamaican politician and academician Norman Girvan. Program July 2 Casa del Caribe, 9pm Welcoming show. July 9 Casa del Caribe, 10am Rumba meeting Centro de Prensa del Festival del Caribe, 11am Presentation of the 35th Festival del Caribe, 2015 dedicated to the 500th anniversary of Santiago de Cuba Desde el parque Céspedes hasta la Alameda, 6pm Fire Parade, dedication of the 35th Festival del Caribe in 2015 and the Burning of the Demon.